PWCFF-R35-C38 - Password JDM Carbon Fiber Fenders - Lightning Motorsports - Selling Speed since 1996 ! 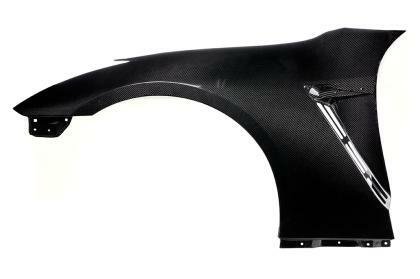 Introducing the PWJDM GT-R Wide Frontal Fenders… It’s a known fact that the GTR suffers from “understeer” which will be amplified once you add more power to the machine. Let’s face it… how can we ever leave “well enough” alone? There is nothing wrong with leaving a perfectly great machine like the GT-R in bone stock form. Hell, in stock trim, it kicks the living daylights out of cars 3 times it MSRP. For the fellas here at PWJDM… and especially for ADHD me… leaving well enough alone can be left to the competition. I was born to modify the hell out of any car that I own. The GT-R is no different. 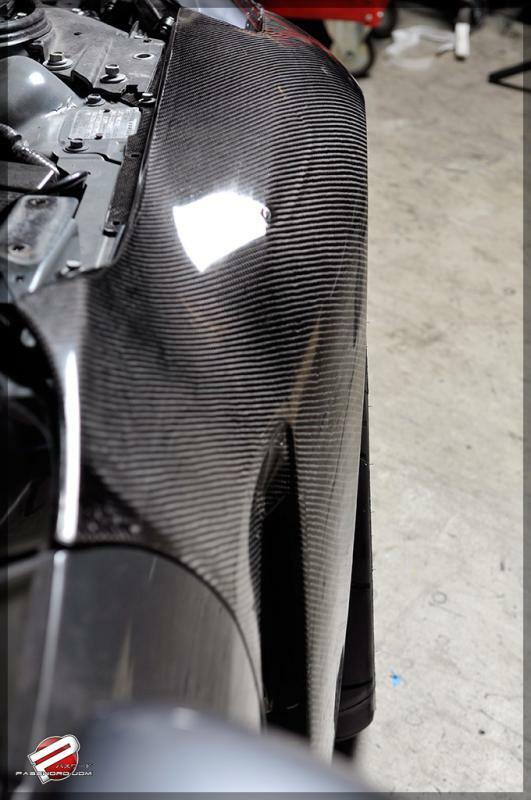 For starters… we have done quite a bit, and for the most recent, we have completed the development on the PWJDM GT-R Wide Fenders. Extended a full 38mm, and much lighter than stock, the PWJDM Wide Front Fenders were designed to accommodate a 20×11 wheel wrapped in 315/30/20 Toyo R888. These are the widest tires available for the rear of a stock GTR, it was only fitting that we develop Wide Front Fenders so these can be had up Front as well. Being an AWD car, it’s only fitting that the same tires are on all four corners. 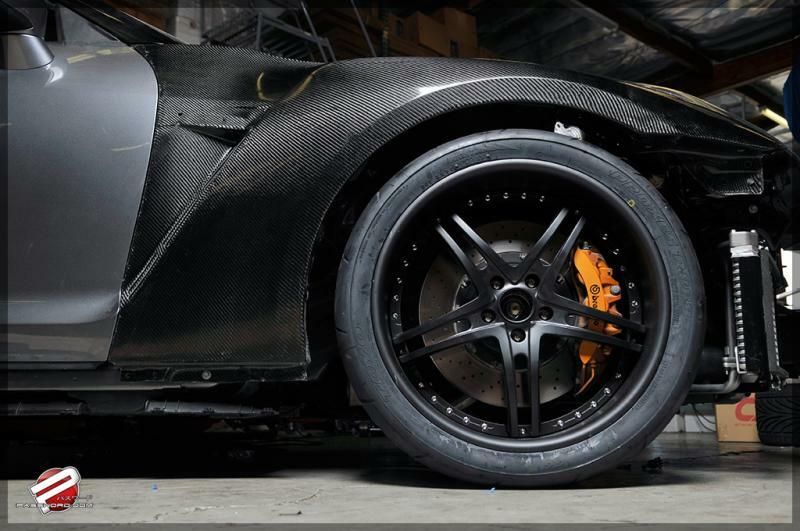 With these PWJDM GT-R Wide Front Fenders, we can certainly claim that our goals have been achieved. You can easily push that corner that much faster when you know your car will be able to handle it. Getting wider fenders to accommodate wider tires are a must if you seriously drive your GT-R. Road sailing becomes that much more of a thrill now. ? 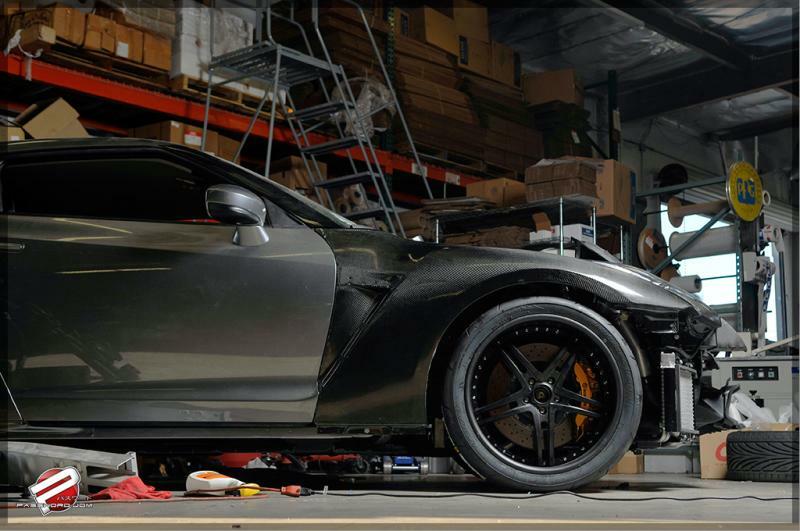 Made entirely of Dry Carbon and reinforced with Kevlar to safeguard from thrown rocks and such… the PWJDM GT-R Wide Front Fenders are the ultimate must have upgrade for any GT-R whether you have power upgrades or not. You will definitely feel the benefits of having larger rubbers up front instantaneously. There isn’t an option like this being offered by anyone else. These took us 200+ days to develop. They have been well thought out. Much consideration was given to aerodynamics, aesthetics, functionality, and having them “ADD” to the overall stunning looks of the factory GT-R. Although aggressive in theory, these Wide Fenders are actually pretty subtle looking. We also deepened the side vents on the fenders to help alleviate the high pressures at increased speeds inside the fender well. The front wheel arches flow perfect with the rear quarters of the car so well that you would think these were designed by factory themselves… to accommodate where the fenders meets the front bumper, we also designed a bumper extension that also deletes the front side markers for a sleek clean look. Since the clear side markers are so hard to get a hold of for a reasonable price, we decided to engineer these fenders to delete them so you won’t have to bother paying a ransom for them. These Wide GT-R Fenders along with the bumper extensions are sold bare dry carbon and is ready for refinishing prep work(painting)**. **Installation is not difficult, but should be left to a professional body shop. Once fitted, the fit and finish is exact. We designed these to hold a very tight tolerance, so we undersized all the holes which can easily be opened up with a drill/rotary for a perfect fit and finish. - Kevlar Reinforced 1 piece single op produced. - And attracts females in droves!